I took a taxi to the airport in Sydney at midday, arriving in plenty of time for my 15:00 flight. It turned out to be delayed a bit in departing though. I met Quan from work and Stuart who used to work with us, both catching the flight to the same conference, Electronic Imaging 2017. We made a joke that Donald Trump might cancel the ESTA visa waiver program while we were in flight, and that we’d all be turned back at San Francisco airport. As it turned out, this wasn’t far from the truth, with news on out landing including the fact that some people with Green Cards were in fact now being turned away from US ports of entry. I’d used a bunch of frequent flyer points to reserve an exit row seat, but this may not have been particularly efficient. The flight was mostly empty, and nearly everyone in economy had one or two empty seats next to them, while I was stuck in the middles seat between two large guys who had also bothered to pay extra for an exit row because they were big and wanted the extra legroom. The row of four middle seats across the aisle and right behind the bulkhead near us was completely empty as we took off. A flight attendant whispered to us that we should keep an eye on those seats and one of us could try to grab them. But as soon as the seat belt sign was turned off after take off, we looked around, and there was a woman already lying across all four of the seats. She stayed there for the entire flight. For the first meal I had chicken cacciatore, which came with green beans and polenta. In the middle of the flight we got a hot gözleme, with cheese and something else inside. The breakfast before landing in San Francisco was a frittata with leek, plus sausage, bacon, and baked beans. I tried to snooze during the flight, but don’t think I did. The entry at San Francisco had been somewhat streamlined, with automated booths for taking fingerprints and photos, but mine didn’t seems to work even after a few attempts at scanning the prints, so I had to go to a manual process with a person anyway. But without luggage, I got through quicker than Quan and Stuart, and said I’d meet them at the hotel shuttle pickup. But I want out on the arrivals level, and only after asking someone figured out the shuttles left from the departure level upstairs. By the time I got there a shuttle was waiting and Quan and Stuart were already getting on! At the hotel, we checked in and I agreed to meet Stuart at 11:00, in about fifteen minutes. I raced to my room and had a quick shower before returning to the lobby. where i waited a few minutes more for Stuart. 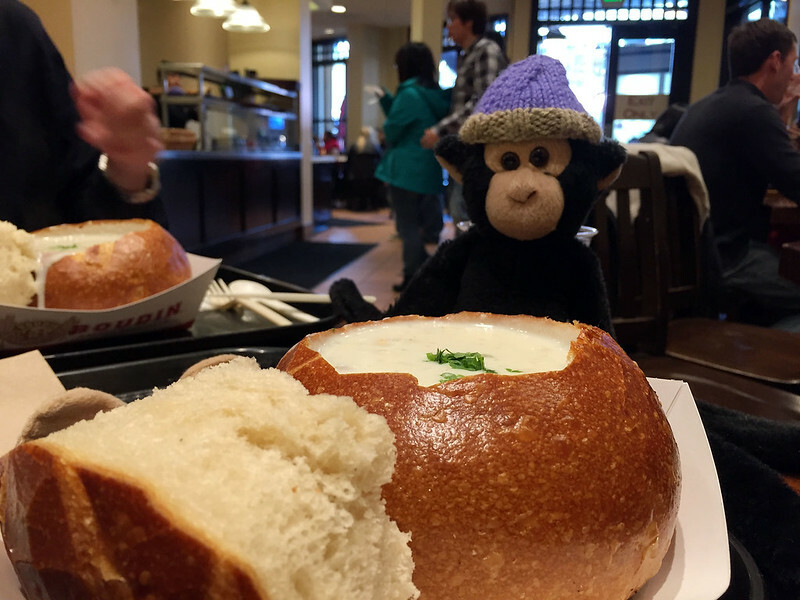 We planned to go into San Francisco to get some clam chowder in a sourdough bowl, which Stuart had been told he had to do. Since this was precisely my plan too, I offered to take him to Boudin Bakery at Pier 39. We walked from the hotel to Millbrae BART station and added some cash to the two old tickets I still had from my last trip here. While there, an old lady asked us for help in loading cash onto her Clipper card, which we had no idea how to do, but worked out by following the prompts, which seemed to help the lady, so that was good. We caught the train to Powell Street and got off there to walk up through Union Square and over to Grant Avenue, where we walked north through Chinatown, avoiding the much steeper hills of the streets a block or two west. 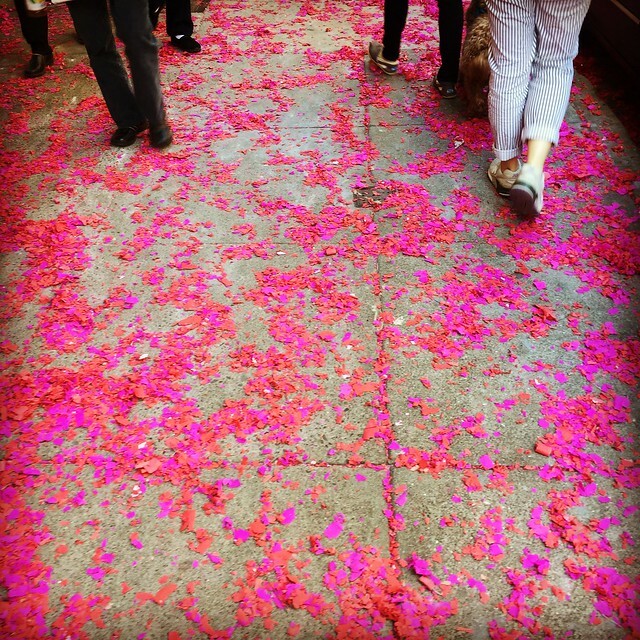 Along Grant Avenue there was evidence of huge numbers of firecrackers having been let off recently for the Chinese New Year, with piles of red paper confetti drifts in the street and on the footpaths. As we walked, every few seconds there was the sharp crack of a cracker or throwdown going off, but we never managed to see who was setting them off because by the time you heard it, it was too late. I’d also warned Stuart about the queue we’d find at the bakery where they sell moon cakes. Sure enough, as we approached I spotted the queue of about 40 or 50 people, trailing out the door and then curling back on itself past the shop in the other direction. Stuart said he didn’t much like moon cakes anyway, so we kept walking. We passed through the Italian area of North Beach, and I showed Stuart what I’d read was the best pizza in all the USA, at Tony’s Pizzeria. But we didn’t stop and pressed on to the shore and Pier 39, where we immediately headed to Boudin Bakery to get a late lunch, seeing as it was now after 13:30. We both ordered a clam chowder in a sourdough bowl. Finding a table was difficult as the place was pretty full. We managed to get one just as two women got up to leave. The soup and bread were excellent as usual. After satisfying our food needs following the long interval from the in-flight breakfast, we wandered around Pier 39 a bit. I determined Stuart hadn’t seen the sea lions on his one previous visit here, so we took a look at those, and got a whiff of their fishy smell too. 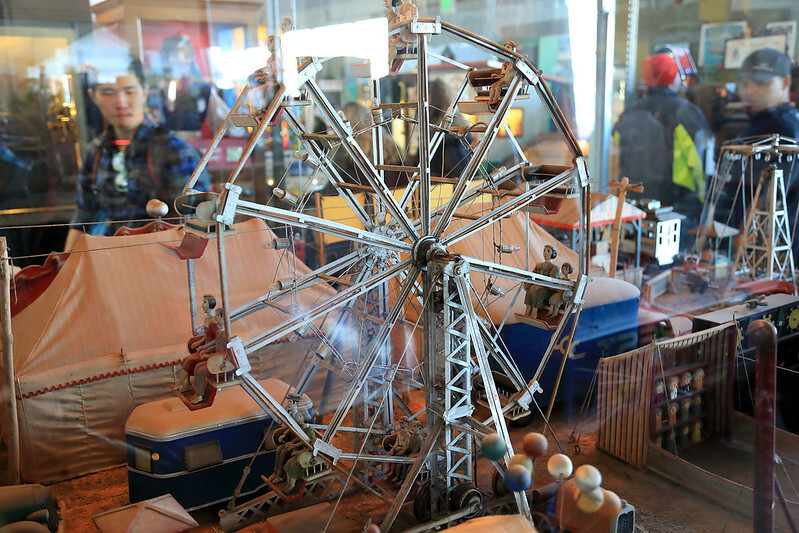 Then we walked slowly down towards the seafood restaurants clustered at Fisherman’s Wharf, then on to the Musée Mécanique, where we spent some time looking at all the old timey coin operated amusements. Several of them were peep show style boxes with an eyepiece and a promise of seeing into a woman’s boudoir or some other tittilating thing. Curiosity got the better of me and I put a dime into one that advertised a glimpse into a harem. Looking through the eyepieces as I inserted the coin gave literally a 10 second view as the light inside the box went on, of a triangular bit of wood with two matchstick legs, “dressed” in a frilly bit of lace, wobbling back and forth by some motor in a sort of “dance”. And then the light went off. I now suspect none of these peep show boxes have actual photos of anything at all, but that they are probably all similarly crude models that just make you smile with a wry grin as realise you’ve been conned out of a coin, in very best P.T. Barnum style. 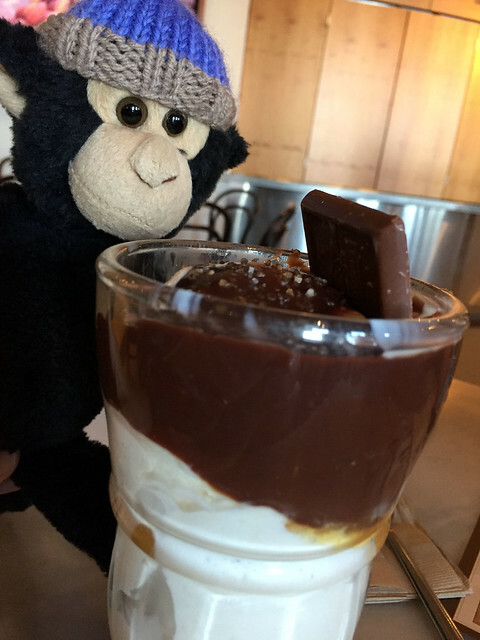 We continued walking to Ghirardelli Square, where we sat and rested while we devoured one of the huge ice cream sundaes each. Stuart chose the choc mint one, while I opted to try the salted caramel “Ocean Beach”, which turned out to have actual sprinkles of sea salt layered in with the ice cream, caramel, and chocolate fudge. It was delicious, and very filling so soon after the soup and bread. By now it was around 16:30 and Stuart wanted to get back to the hotel before it was too late, so we walked to the F streetcar terminus to wait for one of the historic streetcars to take us back to Market Street and a BART station. But the first thing to arrive was an electric bus, displaying an F route sign. The people in the queue at the stop in front of us wanted a streetcar too, and said they’d wait for the one visible behind the bus instead, so we opted to do the same. It took an extra few minutes, but was worth it not only for the ride on the old streetcar, but also because the cash machine was broken so we got a free ride! 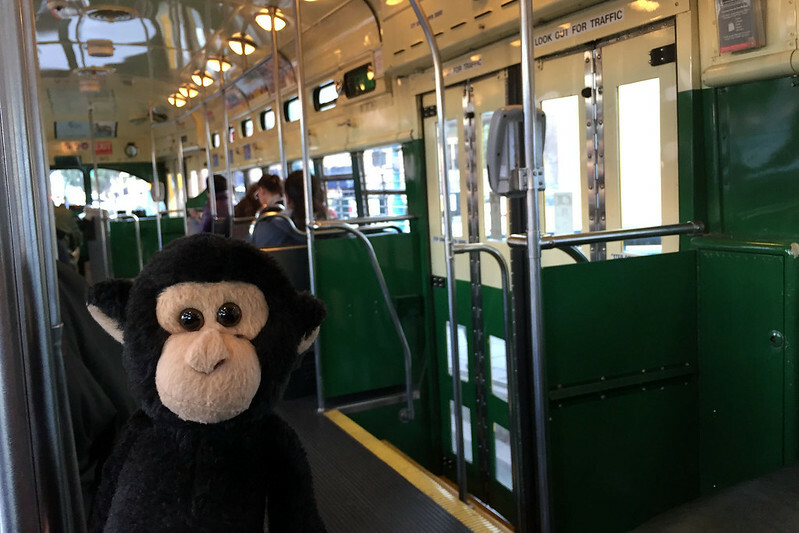 It took us as far as the Ferry Building, and I had decided that we should stay on as it continued down Market Street as far as Powell Street, but the driver declared it was the end of the line and we all had to get off. So we alighted and began walking the couple of blocks to Embarcadero Station. The Saturday market stalls were just packing up for the evening. I wondered if the man who I’d bought M’s silver cuff bangle from was there, so I could tell him how much she liked it. I looked for his stall and found it, but the man was nowhere to be seen. The guy at the next stall asked if he could help me and I said I wanted to talk to the stall owner and tell him my wife liked the bangle I’d bought from him a year ago. He said the guy had gone to get his car to pack up for the night and would be a while, but he could pass the message on for me. We got on the train at Embarcadero. As it progressed to Powell Street, a guy with no shirt on came through the car and went into the last one behind us, muttering something. He smelled terrible, like he hadn’t had a shower in a year. The train stopped at Powell Street and the driver announced it would be staying there a while, then asked if the passenger who had called him on the intercom could call back. While we looked around and waited, four police officers came into our car and asked about the disruption. Someone told them about the guy who had gone into the last carriage, saying he’d been behaving threateningly, and the cops went down to that carriage. We didn’t see what happened after that, but the train left a few minutes later. At Millbrae we walked back towards our hotel. We decided to stop in at In-N-Out Burger along the way to get a simple fast food hamburger for dinner, to prevent the sugar crash from the sundae and take us through to breakfast. 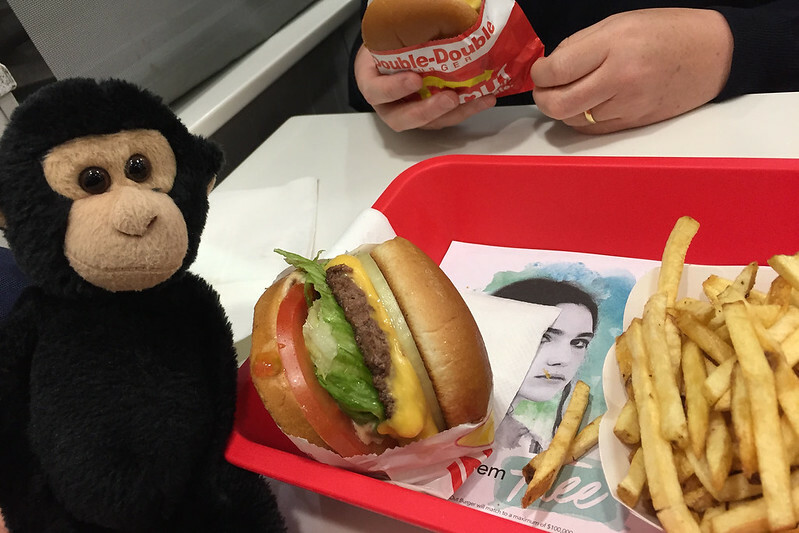 I decided to get just the cheeseburger, for $2.75, while Stuart opted for the double meat, double cheese burger, and we decided to share a serve of fries. While waiting in the queue and chatting about the calories listed on the menu, a young woman, about 20 years old, in front of us turned around and asked if we were from Australia. When we said yes, she told us she’d spent time visiting mainly Melbourne, but also Sydney, the Outback, and the Daintree. She said she had friends in Melbourne and they’d been telling her about the general Australian reaction to the election of Donald Trump, and she told us not to worry too much because California was a bastion of enlightenment and sensibility and the west coast in general was more sensible than the people in the rest of the country. So we’d been in the US for about eight hours and already a total stranger had apologised to us for her country having elected Trump. Again I had trouble finding a table for us to eat at, as the place was pretty full of people having burgers. Stuart made the order while I minded the only free table I could find. They had about ten orders queued up before him, so it was a bit of a wait. The burger had nicely crispy lettuce and fresh tomato slices, a thin meat patty, a layer of melted cheese, and a big slice of raw onion, on a soft bun. It was not bad, though lacking slightly in the depth that would have been granted by a slice of beetroot and a fried egg. Certainly better than McDonalds. The fries, however, were a big disappointment. They were thin and really dry inside, with none of the fluffy potato goodness you expect from a good chip. It was like they’d made hot chips in the same way they made Pringles, even though Stuart swore he’d seem them slice genuine whole potatoes into the slivers and put them into hot oil. After eating we walked the rest of the way back to the hotel in the post-sunset darkness. Back in my room, I called M. on FaceTime and described my day, in between typing up this diary. I tried installing the Uber app to use tomorrow to get to Mori Point for the walking I’m planning, but it needs to SMS me a confirmation code, and I don’t have phone roaming, so I can’t set it up. I’ll probably just have to get the hotel to call me a cab. And now it’s bed time, a bit before 22:00. Hopefully I’ll sleep through and wake up around 07:00 ready for a day of exploring tomorrow. This entry was posted on Tuesday, 14 February, 2017 at 15:45	and is filed under Diary. You can follow any responses to this entry through the RSS 2.0 feed. You can skip to the end and leave a response. Pinging is currently not allowed. Love In-n-Out burgers. REALLY not fond of their fries for the exact reasons you mention, unless I order them Animal Style (which is really more about them being a vehicle for sauteed onions and thousand island dressing).